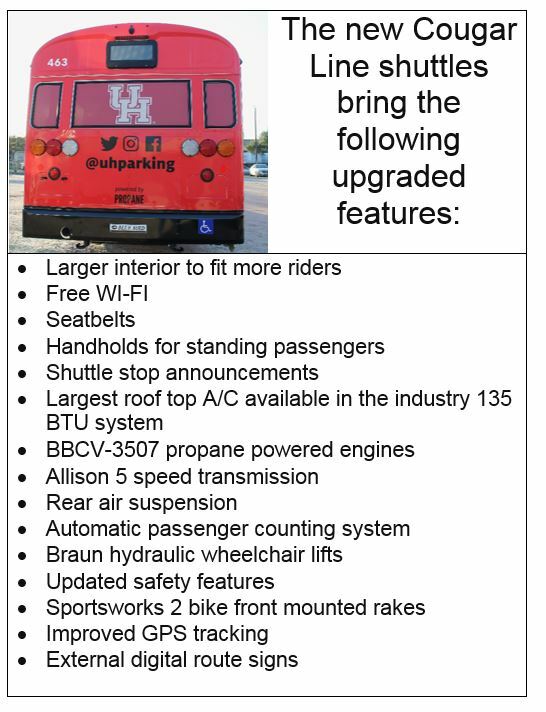 Check out Cougar Ride, a new pilot after-hours campus transportation service available to the campus community under way by UH Parking & Transportation Services as part of the multi-faceted approach of the Transportation & Security Work Group. 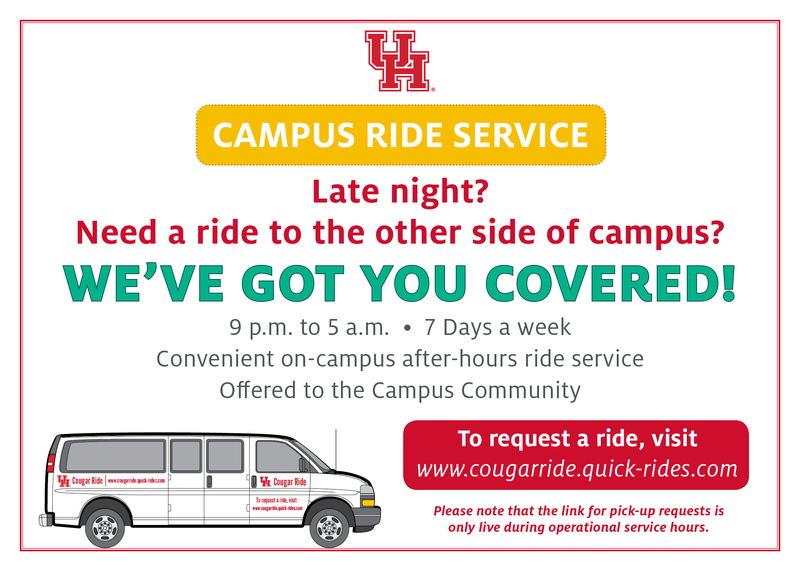 Offered seven days a week from 9 p.m. to 5 a.m., Cougar Ride, represents a collaborative effort toward on-campus options for after-hours transportation. Riders can request service online starting at 9 p.m. each night through 4:45 a.m. each morning. Outside of those times, riders cannot request service through Cougar Ride. For shuttle service during regular hours, please see the information below. Wrapped in the University's signature red and white colors, the Cougar Line shuttles welcome you to the powerhouse. The school spirit continues onboard where passengers will find cloth seats with the UH logo emblazed on them. There's even ample air-conditioning to make for a comfortable and quick ride. 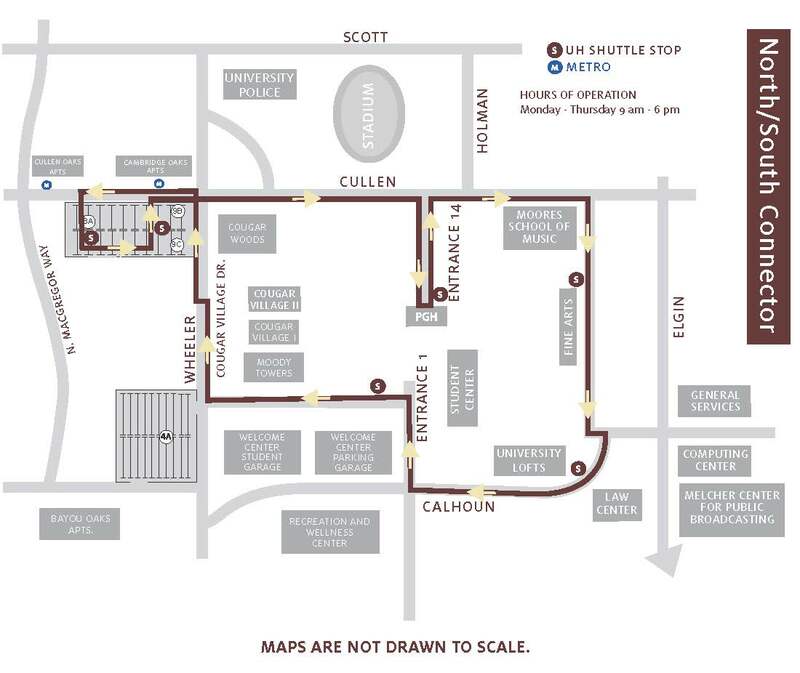 New Cougar Line shuttles are coming to campus Monday, Nov. 5! Learn more about these new and improved shuttles below. Monday through Friday from 7 a.m. until 7 p.m.
Monday through Friday from 6 a.m. until 11 p.m.
Monday through Thursday from 7 a.m. until 11 p.m.
No shuttle service: Campus wide on May 28, 2018 Memorial Day or July 4, 2018 Independence Day. 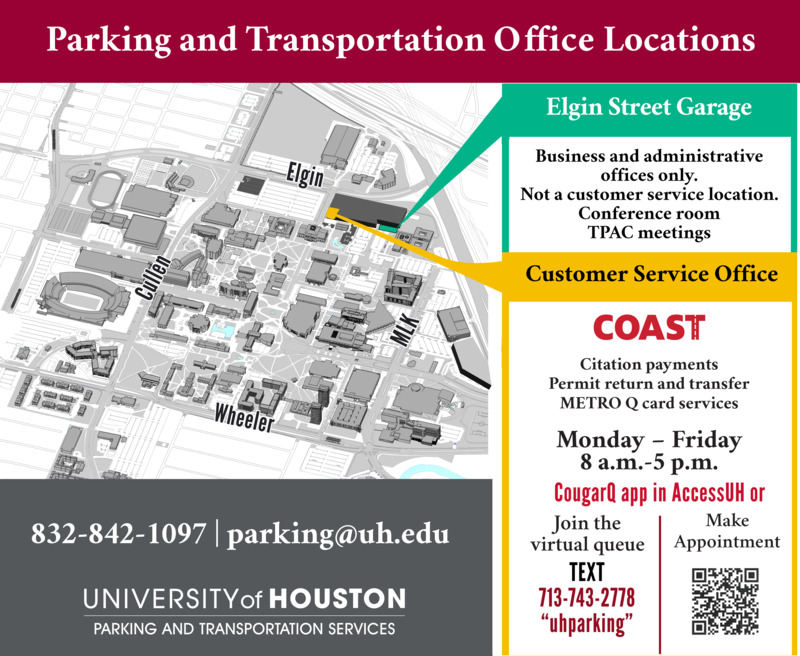 Cougar Trax is a real time GPS tracking system designed to show you when the next UH shuttle will be at a specific shuttle stop. Access Cougar Trax on the website. Advertising space on the shuttle buses is rented on a monthly basis. Learn more. For lost and found inquiries please email parking@uh.edu.